The rise of online fundraising techniques over the past decade has changed the ways that nonprofits attract support. However, online fundraising campaigns represent more of a tool for periodic engagement and audience growth rather than sustained donor engagement. That is, online campaigns are great for generating a burst of interest in your work, but it’s difficult to keep those new supporters engaged until your next campaign without other strategies in place. This means that events should still be the backbone of your donor engagement strategies. From classic fundraising events to networking meetups, community outreach gatherings to donor recognition dinners, nonprofit organizations host all kinds of events for their constituents and communities. While extremely effective, online fundraising campaigns represent more of a tool for periodic engagement and audience growth rather than sustained donor engagement. That is, online campaigns are great for generating a burst of interest in your work, but it’s difficult to keep those new supporters engaged until your next campaign without other strategies in place. By translating that online energy into real-world interaction, your nonprofit’s events serve the invaluable role of maintaining engagement with supporters during and between your major campaigns. Of course, the increased centrality of your events to your overall engagement strategies means that your supporters and neighbors need to actually attend! Your event marketing strategies must hit the mark in order to maximize the impact of all the fundraisers, parties, meetings, and dinners you work so hard to plan. Determine your marketing goals. How many attendees do you want to attract? How many volunteer sign-ups do you need to secure? Work with other members of your nonprofit’s team to develop a marketing budget. Consider your target audience. What is the nature of your mission and of this specific event? What groups might be more interested than others? Consider your past events. What marketing strategies worked well? Do you have any promotional materials or photos that might be useful? Begin your efforts online, focusing on promoting your event via social media. Then focus on traditional marketing with newspaper ads, flyers, and other promotional materials. Remember to start as early as possible. It’s crucial that your team has enough time during the entire event marketing and promotion process to adjust your strategies if something doesn’t seem to be generating much response. These general best practices are an excellent foundation for developing your own, more customized event marketing strategies. Once your team fully understands the nature of your event and the goals of your marketing efforts, you can then work on incorporating more engaging techniques into the process. Designing and ordering custom printed shirts has long been a stand-by strategy for nonprofit organizations. They’re perfect for promoting nonprofits for a few reasons, the most important of which is the fact that people enjoy using their personal style to reflect their personal values. This means your supporters can feel great about supporting your nonprofit’s work while actively promoting it at the same time, just by purchasing and wearing your branded tee. 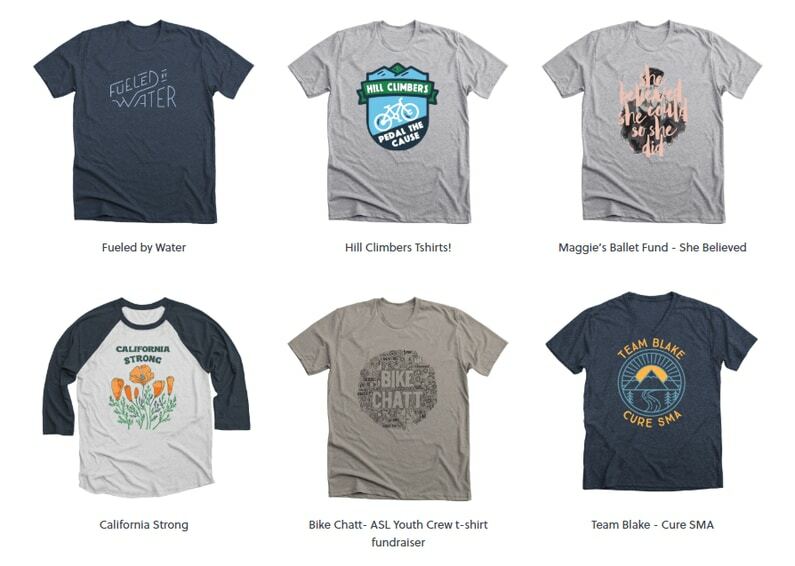 When it comes to promoting a fundraising event, it’s typically a smart idea to create both an event-specific t-shirt and a more generic branded shirt that features your nonprofit’s logo or your campaign’s tagline in an attractive design. Offering at least a little variety this way ensures that your supporters will be able to find a t-shirt design they like no matter how you choose to incorporate them into your broader marketing strategies. Promote free merchandise to your first 100 attendees or early registrants. Create a special t-shirt design to offer for sale online before the event with a t-shirt fundraising platform. This is a great strategy for team fundraising or other public events. Offer discounts on t-shirts or other merchandise in exchange for sharing your promotional posts, donating to your campaign, or volunteering for the event. Give event volunteers free t-shirts. This can be a smart strategy to recruit help for your important team tasks like setting up and cleaning up. You already know that merchandise can be extremely valuable as a fundraising tool because it serves as a physical reminder or token of your organization’s work. Offering t-shirts early to raise interest or promoting free merch for your first guests are foolproof ways to leverage that value for promotional purposes. If you’re interested in also promoting your event with more ground-level techniques, always reach out to local small businesses for partnership opportunities. Small local retailers may be interested in displaying your merch! Whenever possible, use integrated fundraising software and event planning tools. These all-in-one capabilities can provide a serious boost to your marketing process for a number of reasons. These sets of tools can completely streamline the event registration process by automating some tasks and providing central control panels for others. For instance, offer your guests tiered ticketing options, then automatically send them PDF tickets to their registered email address. A streamlined registration process can be a major draw for potential guests who might purchase their tickets impulsively. In terms of marketing your event, use your integrated fundraising tools to your advantage. One example that can make a huge difference in your final event donation amounts is offering your invited guests the option to quickly make a donation on top of any ticket purchases. Those unable to attend would likely be motivated to at least make a donation instead. This can be an extremely effective message for your event marketing materials! Consider including a note like this: “Unable to attend? We’ll miss you, but remember that it’s not too late to show your support!” Then provide an easy way to make an alternate donation instead of a purchase. Providing intuitive options and using your event marketing materials to promote additional or alternative engagement is a best practice that your nonprofit can’t do without. ‍However, are your multichannel marketing strategies really providing as much as value as they should? Many nonprofits use diverse marketing outlets because it’s easier than ever to get the word out. While that’s never a bad idea, it can lead to a lot of wasted effort without a guiding strategy behind it. Re:Charity’s guide to fundraising metrics describes this as “tracking the noise and not the signal.” Simply tracking engagement with your marketing and promotional materials won’t help refine your strategies unless you track how the different channels support one another. In this case, this entails specifically tracking completed conversions on your registration page from your email. By determining how well your email encouraged engagement with your event page, you can better learn what elements worked and what didn’t. This is an important concept for event marketing since it typically involves several different outlets. We’ve already touched on how nonprofit events are essential for keeping your community of supporters engaged and invested in your work between major campaigns. While many fundraising events are planned and hosted in the context of a fundraising campaign, they’re often treated as a separate piece of the campaign rather than an integral part. Consider conducting a fundraising campaign that uses engaging events as central structural elements. Peer-to-peer fundraising campaigns are a perfect example because they make it easy to market both your event and campaign goals at once. Plan your peer-to-peer fundraising campaign and 5K event, and recruit volunteer fundraisers to host their own campaign pages. Leverage their social networks to promote events, solicit pledges, and register participants. Have each volunteer lead their own fundraising team of supporters. Host a number of training sessions, group workouts, community game nights, or other events that can contain competitive elements across the length of the campaign. Have your volunteers heavily promote the campaign and mini-events while your team focuses on marketing your 5K to the rest of the community. Host the 5K, making sure to record the times of each peer-to-peer campaign participant. Organize a finale dinner and awards ceremony to recognize high achievers, reward winning teams, and announce the results of the entire campaign. Marketing your nonprofit’s events can be challenging for inexperienced teams, but a few best practices and expert techniques can help generate more interest than ever before. Start by following a foolproof promotion strategy, and then focus on offering physical perks, using data in smarter ways, and taking a comprehensive view of your campaign goals. In our age of digital media, it can be all too easy for our messaging to get lost in the shuffle. The right underlying strategies can make a huge difference in ensuring your supporters actually engage with your material and then show up on the big day.